Engin Inel Holmstrom first read Jane Austen’s “Pride and Prejudice” as a sophomore in college when she was learning English, and every year since then, she picks up the novel to read it once more. 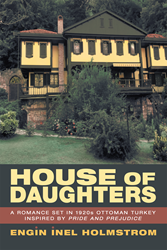 In her new book, “House of Daughters,” Holmstrom takes Austen’s characters out of the drawing room and reimagines them as independent, modern women who are involved in the social and political changes occurring in 1920’s Turkey during the last days of the Ottoman Empire. As the British occupy Istanbul, Emin Efendi can only think about marrying off his five daughters to a life of security and fortune. His favorite daughter, Perihan, falls in love with a wounded and handsome Turkish officer, but the young man eventually decides that his family’s status is too important to him, and leaves Perihan heartbroken and resentful. In “House of Daughters,” Austen fans can find ripples of their favorite author’s work while being thrown into a new storyline of romance, adventure, and family saga.